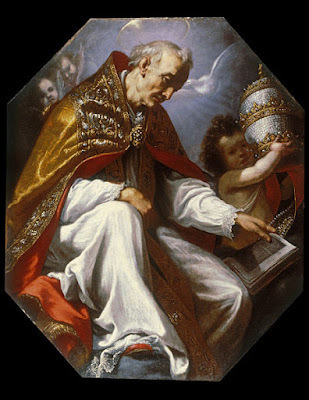 Today is the OF feast of one of the four great early Latin Fathers and Doctors of the Church, St Gregory the Great. The others are Ss. Jerome, Ambrose and Augustine. A Benedictine monk, Gregory was known as the Father of Christian Worship because of his reforms to the Roman liturgy, and of course Gregorian chant is named after him (although the degree to which he actually composed it is not so certain). He is the Patron Saint of musicians, singers, teachers and students. “He was born in Rome and followed the career of public service that was usual for the son of an aristocratic family, finally becoming Prefect of the City of Rome, a post he held for some years. He founded a monastery in Rome and some others in Sicily, then became a monk himself. 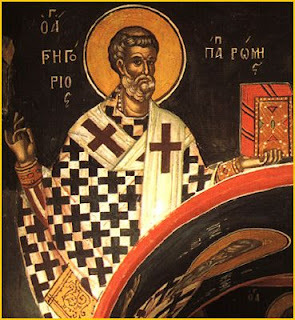 He was ordained deacon and sent as an envoy to Constantinople, on a mission that lasted five years. This painting by Jacopo Vignali is on the ceiling of the library of the Dominican house of Santa Maria Novella in Florence. It was painted about 1630, one of a set which show the four Latin Fathers mentioned earlier. He is seen from below, and is there for the contemplation of the studying friars. An angel holds the papal tiara, as the dove of the Holy Spirit comes down to him to inspire him in his writings. One imagines that the friars would look at this painting and hope that Divine Wisdom would be given to them also. Stylistically, the painting is classic 17th century baroque: we see the contrast of light and dark which is part of the visual vocabulary of the baroque - symbolizing the Light of the World overcoming the darkness. It is interesting to note that the face of St Gregory is in shadow. If this were a portrait, the artist would focus very strongly on the facial features. However, in naturalistic baroque sacred art, the artist emphasizes the facial features less than if he were painting a portrait of the same person. This is because the purpose of the two genres is different. A portrait seeks to emphasize the individuality of the person, what makes him distinct from all others. Sacred art, on the other hand, seeks to emphasize those aspects that are common to all of us; the desire of the artist is to create an image that inspires us to emulate the deeds of the Saint. We can never emulate those aspects that are peculiar to Gregory, only those qualities in him that are common to all of humanity. So, baroque sacred art seeks to emphasize the whole person. In this respect it is a question of balance; the artist does not wish to remove the sense of an individual altogether, for we always ascertain the general through the particular. But we don’t want to overemphasize the particular to the degree that the perception of his general human characteristics are lost. This is a mistake that many contemporary artists who have been trained as portraitists make when they turn their hand to sacred art. Very often the work will be skillfully rendered, but in reflecting the portrait artist’s craft, there can be too great an emphasis on the facial features. The end result is something that looks not like a Saint, but a contemporary man - perhaps the artist’s neighbor - dressed up in biblical costume. It resembles a Victorian tableau. If the face is not a main area of focus, then it introduces new problems for the artist. He must try to indicate some sense of emotion and mood, which one would usually do through facial expression. As this is not available to him in the same way, he will tend to resort to other means. We also discern the mood of a person through body language, or as the art critic would call it, “gesture.” Through gesture, displayed in the body posture, the stance and especially what the subject is doing with his hands and arms, that the artist portrays emotion. This is one reason why the dramatic poses we associate with baroque art are present. The artist does not always put the face in shadow as markedly as we see here, but if there is strong gesture, then we tend to focus less on the face when we look at the painting. Vignali’s painting is not the dramatic representation of action that we might see in the lives of others Saints - the Conversion of St Paul comes to mind - but still, he is trying to convey a sense of the person through the pose. Compare his painting with this painting of St Gregory in the iconographic tradition, which is less naturalistic and more highly stylized (and so less inclined to look like a portrait), with greater emphasis on the face. Therefore, there is less need to convey information through the gesture, which consequently is much more restrained. One question that one might ask in regard to Vignali's painting is this - is this really sacred art? Do we need to follow the principles of sacred art when decorating a library? I would say yes, because the end of all education is supernatural, and the Sacred Liturgy cannot be separated from it. Every education ought to be placed in the context of enhancing our love of God and love of God through love of neighbor. This means, therefore, that regardless of the actual subject taught, the worship of God in the Sacred Liturgy is the ultimate end, in this life, of all education. By this we are transfigured and can bring the love of God and divine wisdom into our daily activities, whatever they may be. An education that is not in accord with this, even if it is Catholic doctrine that is being learned, is not a real education at all. It is sacred learning that points us to the place of the greatest teacher who works though the words and actions of the liturgy. This is why in the medieval colleges, such as we can still see in Oxford, the main quadrangle contained the three most important buildings - the chapel, the library and the dining hall. Each is beautifully decorated, and in design, the two lesser point to and are derived from the higher. This painting is telling those Dominican friars exactly that point in regard to study. Writing in 1929, Pius XI wrote the following in his encyclical on education Divini illius magistri: “The proper and immediate end of Christian education is to cooperate with divine grace in forming the true and perfect Christian, that is, to form Christ Himself in those regenerated by Baptism...For precisely this reason, Christian education takes in the whole aggregate of human life, physical and spiritual, intellectual and moral, individual, domestic and social, not with a view of reducing it in any way, but in order to elevate, regulate and perfect it.” In education, as in all things, the Sacred Liturgy is both the source of grace from which we start and the highest summit towards which it is directed. My book the Way of Beauty - Liturgy, Education and Inspiration for Family, School and College is available from Angelico Press and Amazon.